Cross of the Order of Saint Lazarus, founded in circa 1119. Cross of the Order of Saint Stephen, founded in 1561. The Maltese cross is the cross symbol associated with the Order of St. John since 1567, with the traditional Knights Hospitaller and the Sovereign Military Order of Malta, and by extension with the island of Malta. The cross is a white eight-pointed cross having the form of four "V"-shaped elements, each joining the others at its vertex, leaving the other two tips spread outward symmetrically. This is placed on a red background or worn on a black mantle. The term is often wrongly applied to all forms of eight-pointed crosses irrespective of colour or background. The geometric shape of an eight-pointed cross is found in antiquity, and especially as decorative element in Byzantine culture from about the 6th century. The association with Amalfi may go back to the 11th century, as the design is allegedly found on coins minted by the Duchy of Amalfi at that time. 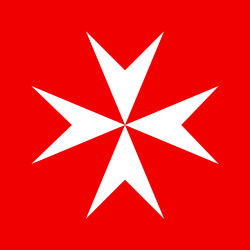 However, there is no historically known and accepted visual evidence that the 8-point Maltese Cross was in use by the Knights of Malta, at any of their predecessor locations, before it appears on the coins of Malta in 1567. Claims by Amalfi that it first appears on their coins in the 11th century is only a reference to a then common style of the 8-point cross pattee. 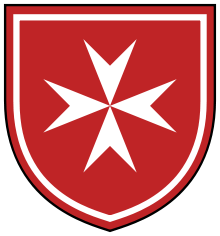 Therefore, Amalfi's claim to the Maltese Cross is through extension from the founder of the order, who was sent out from there to the Holy Land in the late-11th century. 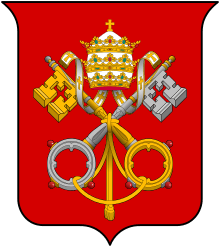 The term "Amalfi Cross" only developed after the 8-point cross was introduced on Malta in 1567. The Knights Hospitaller during the Crusades used a plain Latin cross. 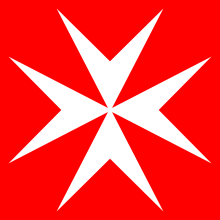 The association of the "Maltese Cross" with the order dates to the late-15th century, it is possibly first mentioned in 1489 in a regulation requiring the knights of Malta to wear "the white cross with eight points". However, these 8-points do not signify that the shape required was that of the four-arrowhead form of 1567, or anything near it, as there are many variants of an 8-point cross. The association with Malta arose after the Knights Hospitaller moved from Rhodes to Malta in 1530. The first evidence for use of the Maltese Cross on Malta appears on the 2 Tarì and 4 Tarì Copper coins of the Grand Master Jean Parisot de Valette (Grand Master 1557–1568). The 2 and 4 Tarì Copper coins are dated 1567. This provides a date for the introduction of the Maltese Cross. The Maltese cross was depicted on the two mils coin in the old Maltese currency and is now shown on the back of the one and two Euro coins, introduced in January 2008. In the 15th century, the eight points of the four arms of the later called Maltese Cross represented the eight lands of origin, or Langues of the Knights Hospitaller: Auvergne, Provence, France, Aragon, Castille and Portugal, Italy, Germany, and England (with Scotland and Ireland). 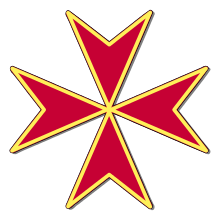 The Maltese cross as defined by the constitution of the Order of St. John remains the symbol of the Sovereign Military Order of Malta, of the Order of Saint John and its allied orders, of the Venerable Order of Saint John, and of their various service organisations. 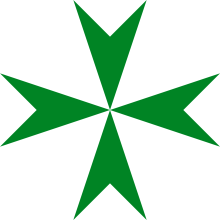 In past centuries, numerous other orders have adopted the eight-pointed cross as part of their insignia (the Order of Saint Lazarus, for example, uses a green eight-pointed cross). In Australia, the eight-pointed cross is part of the state emblem of Queensland. There were 25 emblem designs tested, but the 'emblem depicting four blurred rotor blades', referred to as the "Maltese Cross" was selected as the standard heliport marking pattern by the Army for military heliports, and by the FAA for civil heliports. However, in the late 1970s, the FAA administrator repealed this standard when it was charged that the Maltese Cross was anti-semitic. In the United States today, there are still some helipads that remain bearing their original Maltese Cross emblem. The eight-pointed cross is also used to identify the final approach fix in a non-precision instrument approach (one that lacks precision vertical guidance), in contrast to the use of a lightning bolt type icon, which identifies the final approach fix in a precision approach. The Maltese cross is displayed as part of the Maltese civil ensign. The Maltese euro coins of one and two euro denomination carry the Maltese cross. It is also the trademark of Air Malta, Malta's national airline. The Pour le Mérite, Imperial Germany's highest award for military valor, was a blue-enameled Eight-pointed Cross with golden eagles between the arms. It was founded in 1740 by the francophile Prussian King Frederick the Great, and was adorned with the French legend Pour le Mérite ("For merit") in gold. Awards of the military class ceased with the dissolution of the Hohenzollern monarchy at the end of World War I in November 1918. The coats of arms of the former duchy of Mecklenburg-Strelitz and the former Mecklenburg-Strelitz district contained an eight-pointed cross. Several towns in Northern Germany have an eight-pointed cross on their coats of arms, including Malchin, Mirow, Moraas, Rastow and Sülstorf. Heitersheim and Bad Dürrheim in Southern Germany also have an eight-pointed cross on their arms. In Poland, the eight-pointed Cross forms the base for the country's four highest awards of merit: the Order of the White Eagle, Virtuti Militari, the Order of Polonia Restituta and the Order of the Military Cross. In Portugal, the eight-pointed Cross forms the base for the country's Order of Merit. The cross forms the basic form for some Spanish orders as the Order of Charles III; the Order of Isabella the Catholic the Order of Montesa and the Order of Queen Maria Luisa. In Sweden a eight-pointed Cross forms the basic form for all the royal orders of merit, The Orders of the Seraphim, Sword, North Star and Vasa. 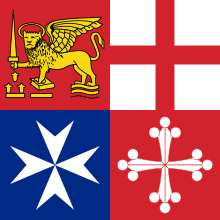 The Naval Jack of Italy features the national coat of arms of four of the former Maritime republics with the "Amalfi cross" for Amalfi in the lower left. Besides the town of Amalfi from which is its namesake, the cross is also displayed on various towns' coats of arms like Aicurzio, Rolo, San Giovanni di Gerace, Fasano, Gizzeria, Murello, Rodì Milici, Blufi, Ronchis, San Mauro la Bruca and the Province of Salerno. Numerous French communes have the eight-pointed cross on their coats of arms. 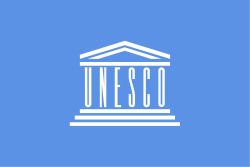 Among them are Drucourt, Eysines and Valcanville in Normandy; Rimbachzell in Alsace; Saint-Jean-de-Bassel in Lorraine; Rontalon in Aquitaine; Chappes in Auvergne; Arvieu in Aveyron; and Auton and Vinon-sur-Verdon in Provence. In Croatia it is on the coat of arms of the town Ivanec, named after the Knights of Saint John. The 14th district of Prague has an eight-pointed cross on its coat of arms. The eight-pointed cross also appears on the coats of arms of several other Czech towns and villages, including Dobřichovice in Central Bohemia; Doubravice in South Bohemia; Staňkovice in the Ústí nad Labem Region; and Medlovice and Orlovice in South Moravia. The flag, badge, and coat of arms of the state of Queensland feature an eight-pointed Cross and as such many public services incorporate the cross, including the Queensland police and ambulance services. The eight-pointed Cross is part of the coat of arms of The University of Queensland. The eight-pointed Cross is also part of the logo for various ambulance services in Australia, such as the South Australian Ambulance Service, the Queensland Ambulance Service, the Ambulance Service of New South Wales, Ambulance Victoria, St John Ambulance Australia, and the Australian Capital Territory Ambulance Service. 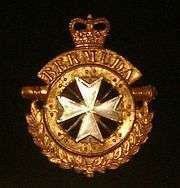 The Cross, known as the Fire Service Star, is also used by Country Fire Authority in Victoria as an official symbol. It can be seen on uniform hats and on Long Service and Outstanding Service Badges. Two Dutch towns, Ermelo and Montfoort, use the eight-pointed cross on their flags, and the former on its coat of arms also. Several municipalities in Spain also use the eight-pointed cross on their flags and coats-of-arms, including Alguaire and Amposta in Catalonia, Lora del Río in Andalusia and O Barco de Valdeorras, Castrelo de Miño, O Incio, Larouco, O Páramo, A Pobra de Trives, Portomarín and Quiroga in Galicia. The Johanniter-Unfall-Hilfe and the Malteser Hilfsdienst, the resp. Protestant and Catholic ambulance services in Germany, have an eight-pointed cross in their emblems. It is used by the St John Ambulance organisation as their main form of identification. In the Philippines, the eight-pointed cross is part of the school seal of Colegio de San Juan de Letran. It was founded by Don Juan Alonso Jeronimo Guerrero, a retired Spanish officer and one of the Knights of Malta and Fray Diego de Santa Maria, O.P., a Dominican brother. Coat of arms of Saint John, Jersey. In the United Kingdom, the eight-pointed Cross is the symbol used by Rifle Regiments, and has been incorporated into the badges of virtually all rifle units, including the capbadge of the Bermuda Regiment, officers cross belt of the Gurkha Rifles and now amalgamated, the Royal Green Jackets. The eight-pointed cross appears on the shirts of St Mark's FC (West Gorton) the forebears of Manchester City Football Club. The eight-pointed cross is the insignia of Methodist College Belfast and it appears on the blazers of the Sixth Form pupils as its crest. 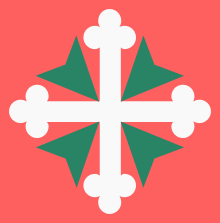 Eight-pointed crosses have been adapted for use in the cross of Saint Lazarus and as part of the flag of Wallis and Futuna. It has been the official badge (combined with an ellipsoid in the center) of the Delta Phi Fraternity since 1833. A similar cross is also used by the Veterans of Foreign Wars organization. 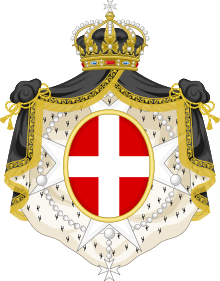 A seven-armed variant known as the "Maltese asterisk", is used as the basis of Britain's Order of St Michael and St George. Other crosses with spreading limbs are often mistakenly called "Maltese", especially the cross pattée. The official symbol of the Alpha Tau Omega fraternity is the cross pattée, though the organization's founder thought it was a Maltese cross when the organization was formed in 1865. The Nestorian cross also is very similar to both of these. Unicode defines a character named "Maltese Cross" in the Dingbats range at codepoint U+2720 (✠); however, the codepoint is usually rendered as a Cross pattée. ↑ National Euro Changeover Committee - Euro Maltese Coins Archived March 10, 2007, at the Wayback Machine. 1 2 "The Maltese Cross and its significance" GuidetoMalta.net, History. Accessed 17 July 2013. ↑ "The St. John Cross" (PDF). St. John Ambulance Service. Retrieved 2010-07-18. ↑ "The Quezon Service Cross". Retrieved 28 January 2013. ↑ History and Heritage / Origin of The Maltese Cross Accessed 17 July 2013.